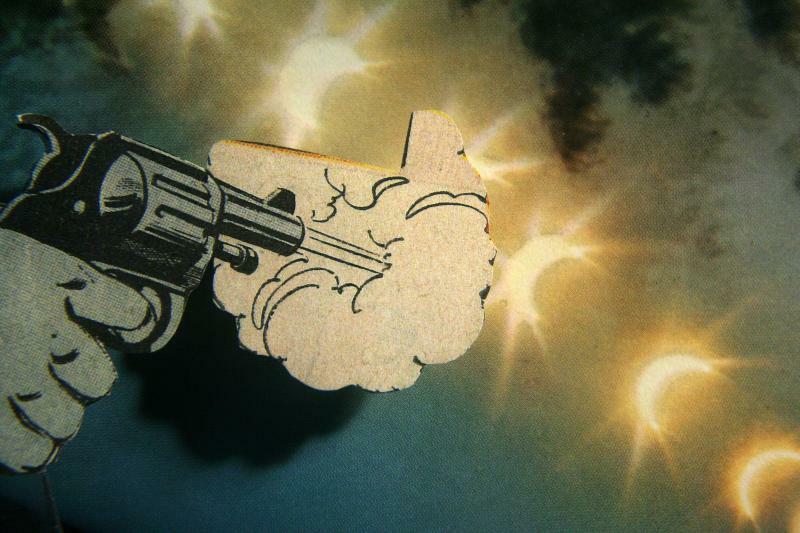 The LFF Experimenta strand provided the first opportunity for UK audiences to see collage artist Lewis Klahr’s Prolix Satori series. Composed of mid-century American imagery such as advertising and comic books, Prolix Satori is loosely structured around a repetition of visual motifs and thematic threads: melodramatic cartoon couples, post-war interiors and pop songs are woven into variations on love, loss and death. Prolix Satori is an ongoing series, and the films presented at the LFF ranged from 8 to 23 minutes, the shorter ones being part of a sub-series, ‘The Couplets’. The Couplets explore the interaction of image and sound through the repetition of imagery paired with different soundtracks, creating surprising shifts in mood and feeling. Klahr was present at the screening, and the Q&A that followed the films offered fascinating insights into his elaborately constructed work. As Klahr explained, the starting point for Prolix Satori was False Aging, a film he made in response to the suicide of his friend and fellow experimental filmmaker Mark LaPore (there were other works dedicated to LaPore in the Experimenta programme, by David Gatten and Phil Solomon). The film starts with a quote from Valley of the Dolls, as a woman’s voice talks about the climb up Mount Everest to reach the Valley and the feeling of loneliness during the journey, followed by her desire for new experiences. This segues into the ‘Theme from the Valley of the Dolls’, whose unusual lyrics imbue the first part of the film with feelings of longing, confusion and loss of certainties about one’s self and the world. The song colours our perception of the imagery, which includes quaint, flowery wallpaper patterns, a yellow bird cut from another wallpaper and coins – maybe small mementoes of home – as well as intimations of a journey: a cut-up globe, markings on a road, a suitcase and a car. The next section, introduced by the label ‘Poison’, sees a cartoon couple, a bike, locks, doors, a medical diagram of a human torso and a chart for endowments at age 30 accompanied by Jefferson Airplane’s ‘Lather’, the lyrics of which revolve around ageing – more specifically turning 30. The final section is constructed around a number of substitutions, using extracts from Lou Reed and John Cale’s Songs for Drella, in which Cale quotes from Andy Warhol’s diary, voicing what Warhol once said about him: ‘What does it mean when you give up drinking and you’re still so mean?’ The recounting of a nightmare on a snowy night and quotes such as ‘Wouldn’t it be funny if I died in this dream?’, ‘I’m so scared today’ and the final ‘Nobody called’ transpose the poignant sense of anxiety, bitterness and loneliness of Warhol’s diaries on to a cartoon blond man looking at an American cityscape. That character is Illya Kuryakin, from the Man from U.N.C.L.E comic, and this is another substitution: Kuryakin stands in for LaPore, as Klahr explained during the Q&A, ‘because he was a handsome man’ (the comic representation of the character is also a substitute for the actor David McCallum). Klahr commented that False Aging initiated a new way of working with lyrics and images, with motifs that recur throughout Prolix Sartori; for instance, a caterpillar seen crawling in some of the earlier films finally turns into a butterfly before getting captured and killed in Lethe. Lethe stood out from the selection not only for being longer at 23 minutes, but also for being more narrative than Klahr’s other films. Evoking the feel of classic Hollywood melodramas, this tale of doomed love in a sci-fi setting was fashioned out of 1960s Doctor Solar comics. The original comic centres on the impossible love story between the radioactive Doctor Solar and his blonde assistant. They also work with an older scientist, and the physical similarity between him and Doctor Solar prompted Klahr to twist the story line so that in Lethe, Doctor Solar becomes younger through the experiments they conduct. Doctor Solar’s transformation continues until he becomes pure energy and his lover has to shoot him, a scene that segues into her shooting at an eclipse, in one of the most poetic moments of the film. The cold modernist décor and the recurrence of a strange clock throughout the film, with odd symbols indicating time, create an otherworldly atmosphere and the impression that we are in some sort of parallel world. After another scene replays the traumatic moment when the blonde woman shoots Solar (this time he has turned into a hairy monster) and then puts the gun to her head, she is seen driving around, lost. A police officer asks her, ‘Where did you cross over?’ reminding us of the underworld river evoked in the title. She then crashes the car and the strange clock goes backwards. Both she and Doctor Solar go through several deaths, as if the moment of death was constantly replayed, maybe to make sense of it, so that they finally realise they have been dead all along. Lethe is set to a Gustav Mahler symphony, which guided the composition of the narrative through its dramatic moments; Klahr called these ‘peak moments’, to which he felt he had to respond. The filmmaker chose Mahler because the symphony reminded him of the score to Vincente Minelli’s melodrama’s The Bad and the Beautiful. This is another instance of the substitution process that seems so central to the construction of Klahr’s work, as well as of the use of music as a structuring device. The Couplets use substitution in a different way. Nimbus Smile, loosely centred around the thematic motif introduced by the speech balloon, ‘I haven’t been sleeping too well lately’ (which recurs in Lethe), sets imagery of comic characters, a man and a woman, to the Velvet Underground’s ‘Pale Blue Eyes’. Interestingly, the film didn’t seem to work initially, because all the emotion just came from the song, rather than the imagery. This was followed by Nimbus Seeds, which sets the same imagery to rain fall and other sound effects. This completely changed the perception of the images, removing the pop video aspect of the previous film and making the visuals more mysterious and evocative. The third Couplet, Cumulonimbus, uses the same soundtrack as Nimbus Seeds, but with different imagery. Wednesday Morning Two A.M. uses this substitution device within the same film, the Shangri-Las’ ‘I’ll Never Learn’ initially accompanying cut-ups of 60s comic images of a couple, before it is repeated to score images of pure colour and abstract patterns. Across the Couplets, the variations of visual and aural motifs wove a remarkably evocative, intricate fabric that suggested a complicated web of thematic, formal and romantic interconnections. Prolix Satori was one of the highlights of LFF, not just in the Experimenta section, but across the whole festival. It was great to see the NFT cinema packed with curious film-goers with appetites for unconventional, adventurous, poetic filmmaking. They were rewarded with a particularly rich and memorable experience that was augmented by Klahr’s engaging presence.